An Illinois House legislative panel is slated to hold a vote this week on a House resolution calling on Governor Pat Quinn to halt a plan by his administration to eliminate all state funding for substance abuse prevention and treatment services. 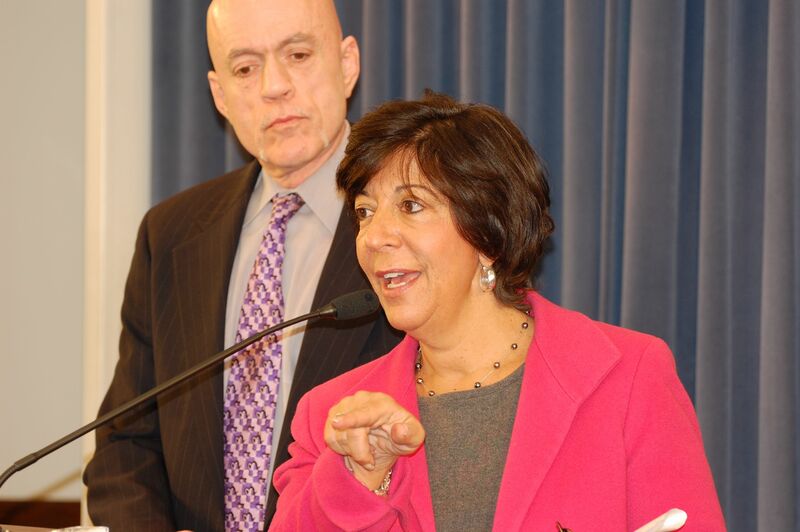 State Reps. Sara Feigenholtz (D-Chicago) and Greg Harris (D-Chicago) at a recent press conference calling for a halt on drug treatment funding elimination. The measure, House Resolution 106, which is being sponsored by State Rep. Sara Feigenholtz (D-Chicago) and 34 other Democratic and Republican lawmakers, faces a vote in the House Human Services Committee on Wednesday, March 9. After an outcry by prevention and treatment advocates, Quinn reduced the department’s budget cut from $208 million to $100 million to avoid a complete elimination of state funded substance abuse prevention and treatment services. However, the uncertainly of the actual amount to be cut in the next two weeks has prompted some treatment providers to continue their service freeze on new clients. Quinn’s proposed Fiscal Year 2012 budget, which begins on July 1, 2011, has also targeted state funding for substance prevention and treatment for complete elimination. That move would end alcohol and drug treatment for 55,000 out of the 69,000 people helped in Illinois each year. The hearing will be held in the Stratton Office Building, Room D-1, in Springfield at 8:00 a.m.
Chad Hays, Patricia R. Bellock, Keith Farnham, Daniel Biss, Mary E. Flowers, La Shawn K. Ford, Robyn Gabel, Lou Lang, Maria Antonia Berrios, Esther Golar, Greg Harris, Constance A. Howard, David R. Leitch, Rita Mayfield, Michael W. Tryon, Linda Chapa LaVia, Thomas Holbrook, Deborah Mell, Naomi D. Jakobsson, Michael P. McAuliffe, Jim Watson, Patrick J. Verschoore, Dave Winters, Robert W. Pritchard, Ann Williams, Jack McGuire, William Davis, Lisa M. Dugan, Mark H. Beaubien, Jr., Dennis M. Reboletti, Karen A. Yarbrough, Daniel J. Burke, Annazette Collins and Dan Brady.